Megan Rice, the 84-year-old nun and Catholic peace activist who broke into a U.S. nuclear weapons complex in protest, has been sentenced to three years in prison for her crime. According to CBS News, Sister Rice, who was joined by two other activists in the break-in, exposed serious security flaws at one of America's top weapons facilities, a place once called "the Fort Knox of weapons-grade uranium." Although officials claimed there was never any danger of the protesters reaching materials that could be detonated or made into a dirty bomb, the break-in raised questions about the safekeeping at the Y-12 National Security Complex [in Knoxville, Tennessee]. The facility holds the nation's primary supply of bomb-grade uranium. After the protest, the complex had to be shut down, security forces were re-trained and contractors were replaced. Sister Rice and the other protestors, Greg Boertje-Obed and Michael Walli, said they were being guided by God help raise awareness and called their actions a miracle. All were found guilty of damaging federal property and sabotaging the plant. On July 28, 2012, the three activists cut through three fences before reaching a $548 million storage bunker. They hung banners, strung crime-scene tape and hammered off a small chunk of the fortress-like Highly Enriched Uranium Materials Facility inside the most secure part of complex. They painted messages such as, "The fruit of justice is peace," and splashed baby bottles of human blood on the bunker wall. "The reason for the baby bottles was to represent that the blood of children is spilled by these weapons," Boertje-Obed, 58, said at trial. Federal District Judge Amul Thapar sentenced the Catholic nun to 35 months in prison Tuesday for sabotage at the Y-12 National Security Complex in Oak Ridge, Tenn., on July 28, 2012. Fellow protesters [Boertje-Obed] and [Walli] each received sentences of 62 months in prison, less than the federal guidelines of six-to-nine years. The three have been awaiting sentencing since being convicted of sabotaging the plant and damaging federal property last year. Three weeks ago, Judge Thapar ordered the three to pay $52,953 in fines but had to postpone sentencing due to a snowstorm. The nun and her two accomplices broke into the facility grounds by cutting through three fences with bolt cutters and sneaking past dogs and armed guards and a sign warning that trespassers risk becoming subject to deadly force. Once inside, the protesters splattered human blood on the wall of a $548 million storage bunker containing much of the nation's bomb-grade uranium, spray painted Biblical slogans of peace, and defaced the exterior of the complex with a hammer. According to The New York Times, Sister Rice has been arrested dozens of times for acts of civil disobedience. In her statement to the court, Sister Rice asked to be given life in prison. "Please have no leniency with me," she said. "To remain in prison for the rest of my life would be the greatest gift you could give me." 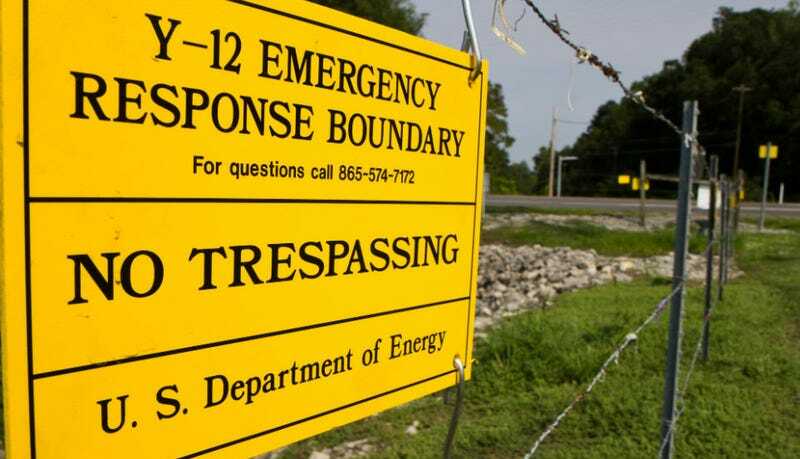 Following a damaging report from the Department of Energy's inspector general on the security failures that led to the breach, the security contractor of the Y-12 National Security Complex was terminated.